Get Help Now - Being bullied or know someone who is being bullied? ARE YOU BEING BULLIED AND NEED HELP NOW? headspace helps young people aged 12–25 years who are going through a tough time. Kids Helpline offers a 24/7 telephone and online counselling and support service for young people aged 5–25 years. Lifeline provides crisis support 24 hours a day, 7 days a week for all ages. Call 13 11 14 or chat online every night. WHAT TO DO IF YOU ARE BEING BULLIED… TAKE ACTION! EVERYONE HAS THE RIGHT TO LIVE, WORK, STUDY AND PLAY IN AN ENVIRONMENT FREE FROM BULLYING, HARASSMENT, DISCRIMINATION AND VIOLENCE. NO ONE DESERVES OR ASKS TO BE BULLIED. PROJECT ROCKIT’s Lucy Thomas shares comebacks (not insults) for dealing with bullying. How to ask a school mate R U OK? by Education.com covers ten actions parents can take to help address bullying, ten actions parents can take if your child is bullying others and ten actions parents can take if their child has been bullied. Download it now. Make it safe for your child to talk to you and teach your child to say “Stop!” or go find an adult. Read more here. 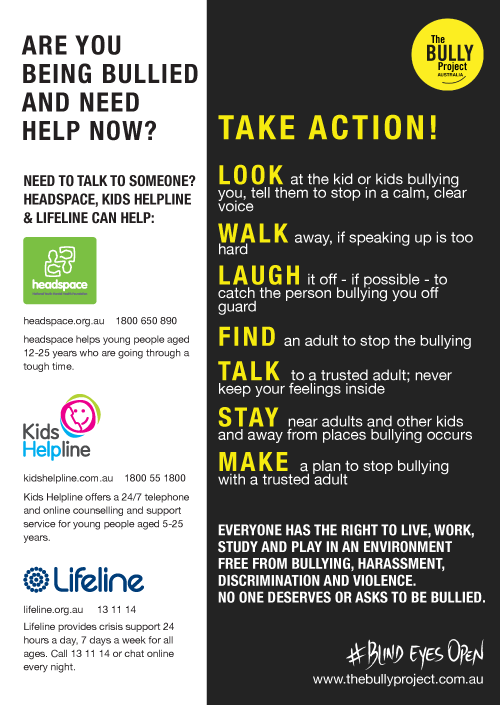 You can get help over the phone and online with Kids Helpline, Lifeline, headspace and Relationships Australia. Every school will have a school policy around bullying so it’s good to ask for it or find it on their website. Talk to your child’s classroom teacher and Principal about your concerns. Make it clear that you are committed to partner with the school in being part of the solution. Also emphasise that your expected outcome is that your child’s ability to feel safe and happy at school is fully restored. Your school should create an action plan to help address the issue. Read more here. This interactive resource helps parents have conversations with their children and empower parents to stand up for their children effectively. Check it out. If you feel like the school isn’t fulfilling your child’s right to be safe at school it’s good to know your rights and if necessary make a formal complaint. There are several ways in which you can approach a formal complaint so read up on your rights and the information that has been compiled by Law Stuff. LAW STUFF is a website dedicated to providing legal information to children and young people in Australia. Know Your Rights within your State/Territory. The Australian Human Rights Commission (1300 656 419) has a complaint handling service that may investigate complaints of discrimination, harassment and bullying. Read more. Get help from the Office of the Children’s eSafety Commissioner. Report cyberbullying with the Australian Cybercrime Online Reporting Network.